How many times have you gone out, purchased a big, bushy bouquet of cilantro, torn off a small handful to use in whatever creation you were focused on at that moment, then shoved the rest of the cilantro into some neglected corner of your refrigerator? Yeah, me too. It happens more often than I would like to admit. I brought a particularly vibrant, dare I say perky, bunch of cilantro home the other day and promised myself to use it. All of it. This zesty, cilantro-centric soba noodle bowl features a hefty dose of the green stuff, pan-toasted tofu, and plenty of vegetables. A few other ideas that come to mind - an alternative version might feature brown rice in place of the soba noodles. I like a bit of kick along with my cilantro, and next time I make try some chopped serrano chile in place of the cayenne. You could do soba noodle patties and use the cilantro dressing as a dipping sauce. Other ideas? Throw them into the comment ring. I'm finally back from traveling (at least for a while) and looking forward to being back in my own kitchen. I was on the east coast for the past five days for a wedding, and in the same shot spent a day with one of my best friends from high school who now lives outside Philadelphia. Lots and lots to share with you inspired by these recent trips. 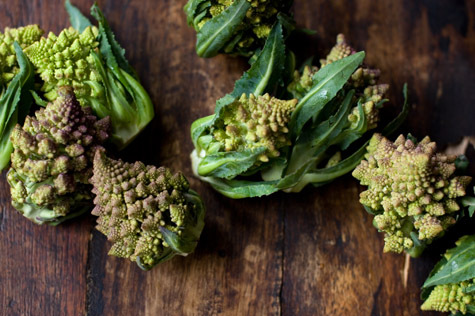 For those of you who aren't familiar with baby Romanesco, you can see it in the second photo in this post. Feel free to substitute any other (lightly cooked) vegetable you prefer - many will work well with the buckwheat and cilantro. Cook the soba in a big pot of rapidly boiling salted water just until tender - but about 20 seconds before the pasta is done cooking add the Romanesco (or broccoli) to the pot. You want it to barely cook. Now drain and rinse under cold running water. Sprinkle with lemon zest and set aside. In the meantime make the dressing by combining the cilantro, garlic, cayenne, salt, and olive oil. Blend in a food processor or chop by hand. Taste, adjust for more salt if needed and set aside. Drain the tofu, pat it dry, and cut it into rectangles roughly the size of your thumb (1/2 inch thick and 1 inch long). Cook the tofu in a dry nonstick (or well-seasoned) skillet over medium-high heat for a few minutes, until the pieces are browned on one side. Toss gently once or twice, then continue cooking for another minute or so, until the tofu is firm, golden, and bouncy. Remove from skillet, let cool a bit and if desired cut into matchsticks (as seen in the photo), sometimes I don't bother and use larger pieces instead. In a large mixing bowl, combine the soba, Romanesco and a couple big splashes of the cilantro dressing. Toss until well combined. Add the tofu and gently toss again, add more dressing and a couple pinches of salt if needed. Turn out onto platter and crown with a couple pinches of cayenne and a squeeze of lemon juice. Serves about 4 - 6. Poached spinach noodles, tofu, and baby broccoli in ginger broth. Finished with a splash of soy sauce, mint, basil, lime juice and red pepper flakes. Quick, simple, and invigorating. A big, slurpy bowl of whisper-thin spinach noodles draped in a spicy curry and herb broth - inspired by a beautiful box of noodles I picked up in Mill Valley, Ca.